The artwork in the Diablo III 2012 Wall Calendar is spectacular. Every month, the selection of artwork makes me want to know more about the artist who created it, the scenes or figures depicted in it, and how they fit into the Diablo III “universe”. This blog is a continuation of my series of blogs that explore the the artwork of the Diablo III 2012 Wall Calendar. At first glance, it was obvious that “Ms. August” was none other than the Wizard. 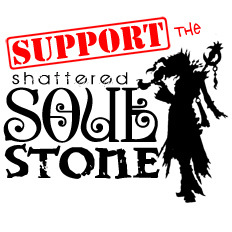 Or, as we tend to say on Shattered Soulstone, she is the Sorceress. A glowing “source” floats above one of her hands. Across her back is a staff with a red gem, that might be a ruby, socketed into it. There are several rolled scrolls attached to her clothing. This is definitely the Wizard. She looks a bit different than the version of the female Wizard that we see in game. This leads me to believe that this image was probably part of the concept art that was created as the game was being developed. If you look closely at the top of the drawing of the Wizard that you see in this blog, you will see the writing at the top. It says: “Victor Lee Jan 2007”. 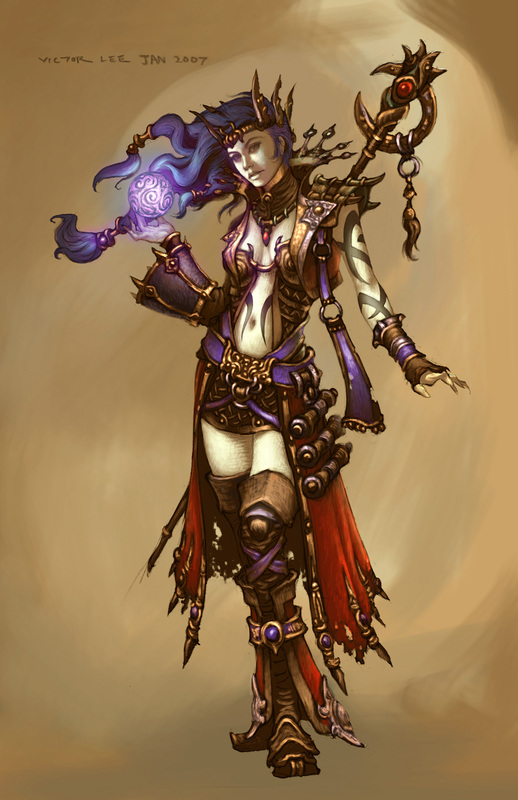 This drawing pre-dates the release of the Diablo III game by several years. Victor Lee is one of the artists who has done work for Blizzard. You can check out more of his work on his website. This particular piece appears on the Diablo III Battle.net website. It was added to the gallery of Artwork on August 1, 2011. You can download the image from there, if you like. It was rather easy to learn about this portion of the artwork that was selected for the Diablo III 2012 Wall Calendar for August. What you cannot see in the above image is the background. You see the concept art, which has no background behind the Wizard at all. For the calendar, the Wizard was superimposed over another piece of artwork. It was interesting to learn that the figure did not originally have this particular background behind her. It took a long time to find out more about the background artwork. When I first tried to track it down, I guessed that perhaps this was the Hidden Camp outside of Caldeum. I turned out I had guessed incorrectly. The background artwork is actually of the Tardein Wastes which are in Kehjistan, in Act II of Diablo III. This piece was posted by Flux in the Gallery at Diablo Inc. Gamers.com on January 31, 2010. To figure this out, I did an image search for Kehjistan because that is where the mage clans started out. This took quite some time! Much of this piece of artwork remains a mystery, at least to me. I was unable to find out who the artist is. I’ve no idea who the figure in this piece is supposed to be. Is he part of the Wizard’s party, who has somehow fallen behind? Or, is he trying to sneak up on her so he can attack, and steal her loot and gold? To me, her expression shows that she is aware of him, and is simply waiting for him to get in range of one of her spells. Putting these two, entirely unrelated, pieces of artwork together into a new image for the calendar makes me feel like I am missing something in regards to the story behind the piece. Then again, now that I know that it is two pieces of art that have been made into one image, I guess there really isn’t a story here, at all. That’s rather disappointing.